Join me. I am just about to start a second, 7-day intuition challenge. What is such a thing? It is 7-full days of tapping into your intuition. You know, your gut. What it thinks? Says? Knows? Our intuition is very wise and often holds all the answers we need if we'd just take a moment to trust and listen to it. I started my first intuition challenge a week ago with my friend, CM, and was so pleased with the results. Each day - several times a day - I have been doing a gut check. I ask my intuition what it is telling me at that exact moment in time. For example, I just asked my intuition, what's going on? And it told me to write this blog post. Don't delay. Our intuition is like that. It knows what we need at every moment of the day and doesn't sugarcoat anything. In fact, one lesson I learned about intuition this past week is that it speaks in very, very short sentences - sometimes it will answer in one word or a concise sentence. Last night, for example, I asked my intuition, what do I need? It answered, sleep. So simple and I was dreadfully tired, so my intuition was - once again - spot on. What I also noticed about my intuition is it doesn't spend time worrying at all. Not even for a split second! It also doesn't spin stories about what other people are thinking or plotting. For example, I just asked my intuition what Mr. UpCyclist needs from me and it answered, love. See how straight-forward and wise it is? Let's try a harder one. A friend is going through a tough time, let's see what my intuition says about that. Intuition, what's up with this tough time for my friend? My intuition just told me, she needs to learn some bigger life lessons (which I translate to mean, my friend isn't being open to all the new learning that comes through struggle and challenge). Now, that I'm writing this blog post and reflecting on the last week, intuition reminds me of one of those shakable magic 8 balls from the 70s, but with real meaning. You can literally ask your intuition any question and it has the answer. 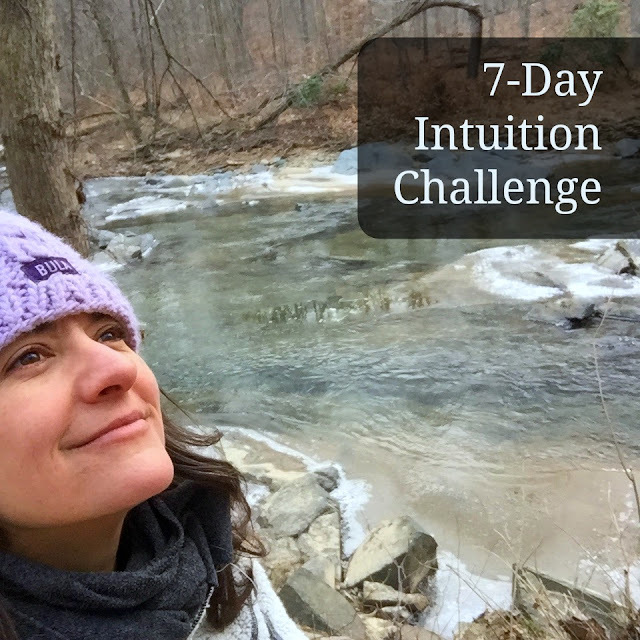 I have loved tapping into my intuition and trusting it knows so much this past week that I'm going to do another 7-day intuition challenge. Want to join me? Just commit to asking your intuition questions throughout the day and see what it has to say. Oh, and one more tip. Intuition is compassionate. It is so wise it doesn't need to be catty. If you do hear shades of cattiness, that's you speaking or another part of you not your wise intuition. I'll check back in a week and on social media to see how you are doing. Let's use the hashtag #intuitionchallenge to peek in on each other. Sale! Yay for Leap Day!